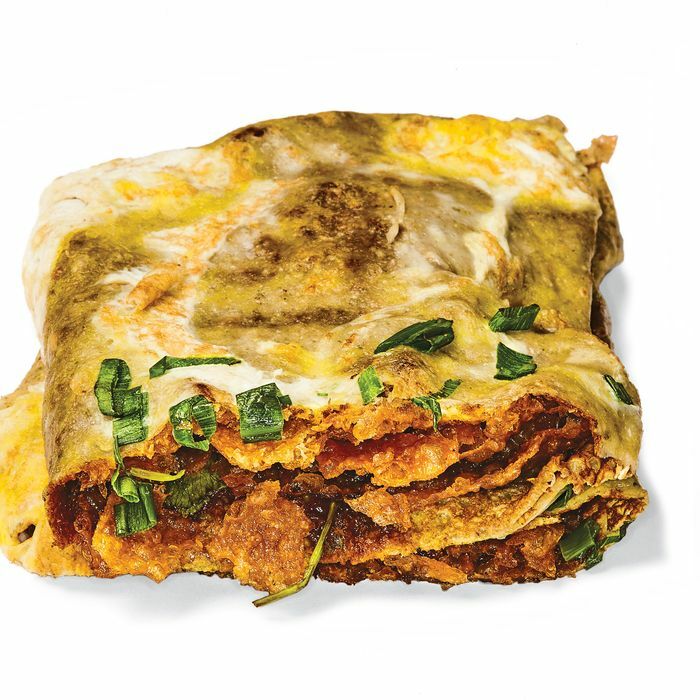 Jianbing, the crossover Chinese crêpe. Twenty-first-century culinary anthropologists could very well chart a course for migratory foodstuffs from country of origin to outer-borough enclave to Smorgasburg stall. And so it is with jianbing, the Chinese street-food breakfast that has emerged as this year’s microcraze. Typically made from a batter of green mung bean, wheat, or other grains and starches and spread with egg, the savory crêpe is strewn with some combination of cilantro, scallions, and pickles; brushed with a chile-paste sauce and a sweet bean paste like tianmianjiang; and folded around either a thin, crispy cracker called baocui or a chewy cruller and chopped in half — all in under 45 seconds. The highly customizable snack likely made its New York debut in Flushing, where versions can now be found amplified with ham at the New World Mall’s Mojoilla Fresh stand, crunchy lettuce at the New York Food Court’s Liang Pi Wang, or a very fine cruller at Sheng Jin Eatery. For our $3.50, though, Flushing’s destination jianbing resides in the Golden Shopping Mall at Express Tea Shop (pictured), which yields to none in the soft stretchiness of its crêpe, the balance of its sauces, and the shattering crispness of its baocui. The import has lately been absorbed into New York’s omnivorous fusion-food culture, stepping into the spotlight (and the Instagram feed) on the food-truck-and-outdoor-market circuit. The Flying Pig truck took to Manhattan’s streets last fall, followed soon after by pop-up Mr. Bing (now at Broadway Bites in Greeley Square) and then brick-and-mortar Bing Kitchen on the Lower East Side. The best version outside Queens can be found at Smorgasburg, where Jianbing Company uses a drier, mixed-flour crêpe that’s firmer and more opaque. Slathered with a dried-chile-based hot sauce and a 13-spice tianmianjiang, it benefits from lashings of sliced scallions and more crispy cracker in every bite.